The Comcast Speed Test, technically called the XFINITY Speed Test (more on that below), is a Comcast-provided internet speed test. This test is a completely free, web-based tool that you can use to see how much available bandwidth to the internet you have right now. In other words, using the Comcast Speed Test, you can get a general idea of how quickly you're able to download and upload information over the internet, which impacts how well movies and music stream, how fast files download, and even how smooth your regular internet browsing is. Visit the XFINITY Speed Test website. Click or tap the Start Test button or choose the Advanced Settings link at the top of that page to change the location of the test server. Wait while the three parts of the test complete. If you're planning on benchmarking your internet speed with the Comcast Speed Test, click or tap the Share your results button and then open the URL that's shown to go to the dedicated page of your results. You can then copy and paste the URL anywhere, be it in a document to save for reference next time, an email to share with someone else, etc. Like almost all internet speed tests, the Comcast Speed Test downloads and uploads a relatively small amount of test data and measures how long it takes to do so. Some simple math involving the size of the data packages, as well as the time they took to download or upload, provides a speed in Mbps. The Comcast Speed Test also tests network latency in addition to upload and download speeds. 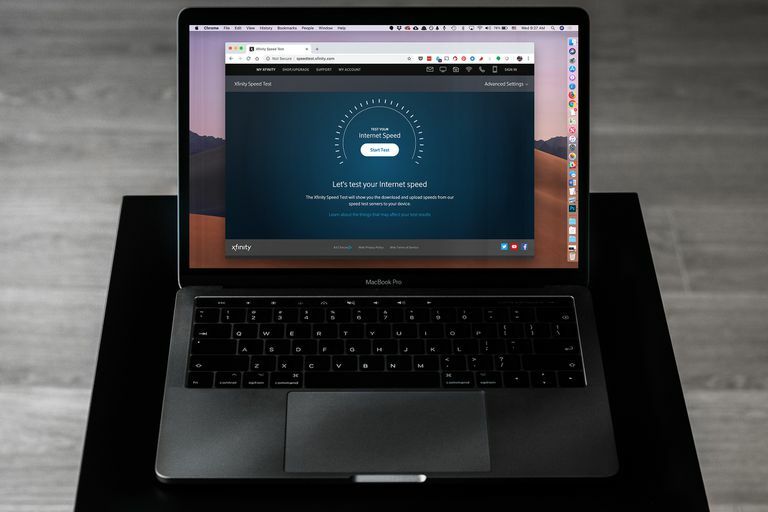 This test connects to the closest of 27 Comcast hosted, OOKLA powered, test servers to perform the test of your internet speed and latency. The Comcast Speed Test is the XFINITY Speed Test. The XFINITY Speed Test is the Comcast Speed Test. They're one in the same. XFINITY is the name given to most of Comcast's consumer services, one of which is XFINITY Internet. Comcast rebranded their Comcast services as XFINITY beginning in 2010. Even though the name change is a number of years old now, the XFINITY Speed Test is still more often referred to as the Comcast Speed Test. "Can I use the Comcast Speed Test if I'm not a Comcast/XFINITY customer?" Yes. The Comcast Speed Test is available for anyone to use to test their internet speed. Keep in mind, however, that there may be an internet speed test tool from your Internet Service Provider which, depending on why you're testing your bandwidth, may be a better option for you. See our Internet Speed Test Sites list to check for a bandwidth test site available from your ISP. "Is the Comcast Speed Test accurate? Is it better than other Internet Speed tests?" With so many variables that impact your Comcast Speed Test results, it's almost impossible to say it is 100% accurate. It's the same with other bandwidth testing sites as well — the uncertainty isn't a Comcast/XFINITY problem alone. That said, considering the fact that you are [probably] a Comcast/XFINITY customer, and assuming that you're testing your bandwidth with the Comcast Speed Test tool to benchmark changes over time or to make a case about your slow connection, I'd consider the test as accurate as needed. See How to Get a More Accurate Speed Test Result for more on this.